I like to share with others people who I admire. 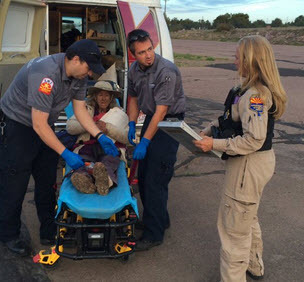 This week I must send out a shout out to a 72-year-old Tucson woman who survived 9 days out in the desert wilderness! Ann Rodgers, survivalist and yes 72, got lost in the White Mountains of eastern Arizona after her hybrid car ran out of gas and electrical power. She had been traveling to her children’s home on Phoenix along with her dog Queenie. Ann is retired military and has taken a survival class here and there. It is not really sure how she got lost in back country near Canyon Creek on the White Mountain Apache Reservation. This story could have ended very badly. I am so glad it had a happy ending. Most of you know that I love to hike and this story just proves that it pays to be prepared! Kudos to Ann! Her survival skills is what made this story have that happy ending! Having some basic survival food and items with her and in her car helped her live. Her car was discovered three days after a search began, but rescue crews struggled to find her. Ann found old animal bones, rocks and sticks and spelled out HELP on the ground. She also started a signal fire. After her dog was found April 9th and that narrowed the search. It was not long after that a helicopter noticed the HELP. Ann was waving at the helicopter as it landed to rescue her. Ann Rogers cry for help! If you hear of hometown hero or special person, please let me know. I would love to share their story.